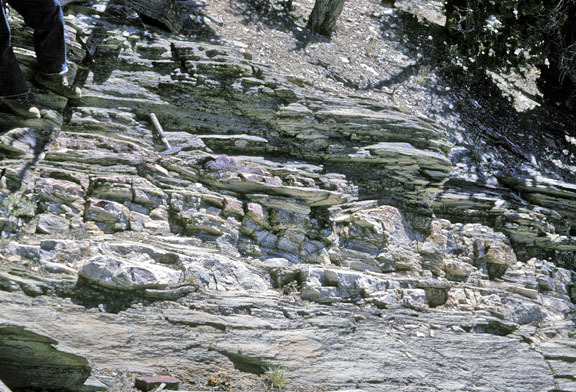 Left: Pinch and swell of middle Poleta quartz and quartz-muscovite-biotite-andalusite schist in south part of aureole in west half of Papoose Flat pluton. Hammer for scale ©A.G. Sylvester, 1964. Right: Calc-silicate hornfels boudins in middle Poleta quartz-muscovite-biotite schist in west half of Papoose Flat pluton. View is parallel to the long axes of the boudins. Most of the boudins are triaxial with the principal stretching direction parallel to the lineation and perpendicular to the long axes of the boudins. ©A.G. Sylvester, 1964. Disk-shaped "chocolate tablet" boudin. 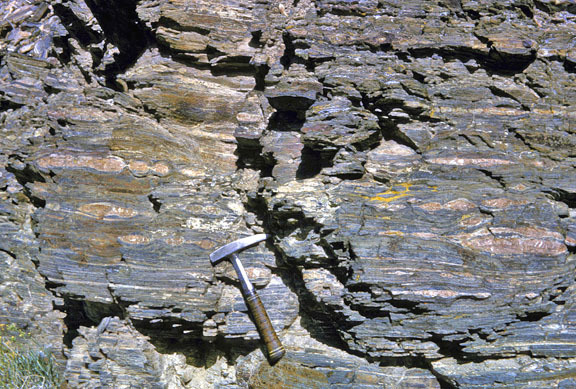 Black squares are patches of quartz-muscovite-biotite schist that have pulled apart brittley and orthogonally, indicating the directions of stretching. Right edge is approximately 20 cm long. These boudins are much less common than triaxial-shaped boudins. ©Arthur G. Sylvester, 2008.